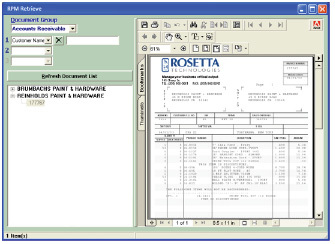 Rosetta Print Manager (RPM), a universal print management solution that reduces total prints and streamlines document delivery to boost productivity and your bottom line. Introducing Rosetta Print Manager (RPM), a universal print management solution that reduces total prints and streamlines document delivery to boost productivity and your bottom line. Make sure every job goes to the right device the first time for the lowest possible cost and the fastest possible completion. Match the right job to the right printer based on document characteristics such as paper size, number of pages, color, MICR toner, finishing requirements, etc. Print the document at the point of need whether across the hall or across the country. Automatically reroute jobs to back-up devices in the event of printer failure or print queue backlogs and eliminate the waste of redundant print requests. Bi-directional communication confirms the target printer’s ability to complete the job with flexible options for delivery notification and alerts to end-users. Minimize the number of devices needed while expanding your range of control. Cross platform flexibility: IT departments running UNIX, Linux, Windows or AS/400 servers can access any printer and route jobs across networks. Submit preprocessed PCL jobs to any configured output destination, regardless of the originating operating system. Eliminate specialized printers with support for integrated bar code printing. Create UPC labels, shipping documents, and more, using ordinary laser printers. 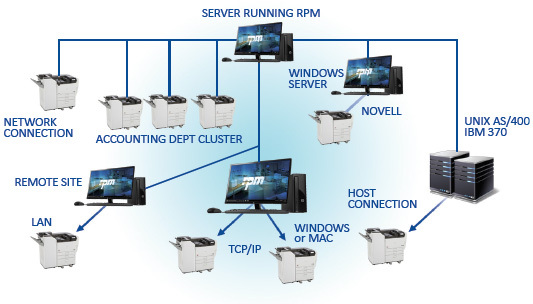 Centralize network printer management to a single point of control with secure system-wide access to print queues; remotely enable/disable devices as needed. Minimize waste and maximize efficiencies by printing – or reprinting – only the pages you need as fast as you need them. Partial Range Printing. Easily select Start and End pages of long reports and stop throwing money into the recycling bin. Proactive Error Detection stops print job errors and waste before it happens. In the event of an error during a job, reprint any page range without regenerating the document from the application source. Remotely match printer configurations to specific job types. Split large jobs among clusters of virtual printers to balance print loads, avoid overages, and speed overall job completion. Gain complete control over forms creation and content from any source, and then print or electronically store and retrieve documents as needed. Optional module eliminates the need for creating and storing pre-printed forms while expanding form creation characteristics. Merge data from applications such as Oracle/ PeopleSoft, SAP, QAD and others into plain paper coupons, mass mailings, invoices, purchase orders, even checks. Simultaneously create electronic images for secure paperless document storage and network retrieval with up to six search keywords. 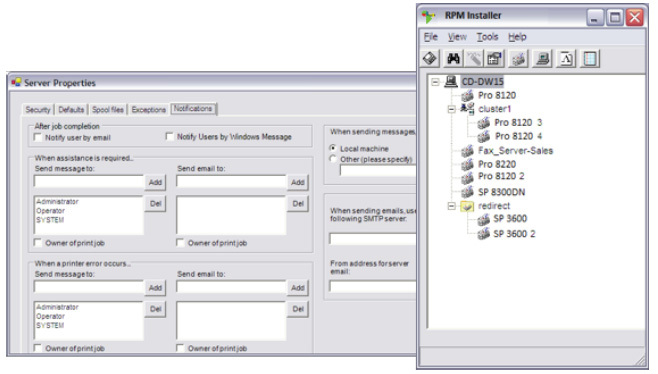 Integrate documents scanned from external sources into document management systems. Keep your information safe and secure and manage all networked devices with easy to use administrative tools. 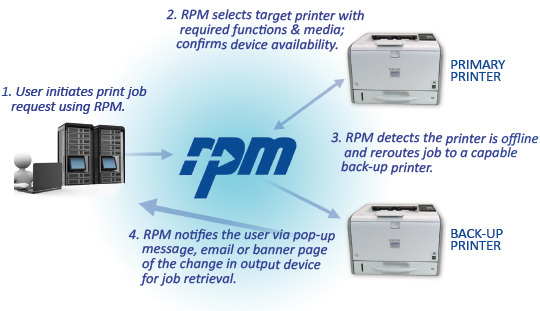 A simplified graphic user interface displays and manages the properties of all physical printers and output objects controlled by RPM. Automatic notifications communicate paper-out, low toner, or other fault conditions to identified IT personnel for fast correction. Easily manage security options, spool file parameters, and Exception/Failover settings to match the workflows and security protocols of your organization. Restrict user access to specific printers or forms to prevent unauthorized printing. Comprehensive job logs capture all activity to discover threat sources and security violations. Accurately allocate printing costs to specific users or departments for chargeback purposes. 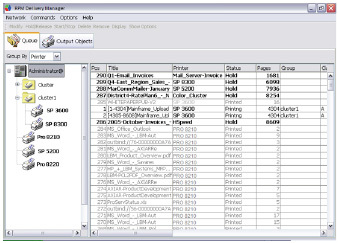 Generate printer statistics and usage reports with graphical representations of print data to identify areas for upgrade or redeployment of existing printer assets.